An important tool a geologist has in their toolkits is the study of modern analogs to interpret similar ones in the rock record. This is a proven method, and oil companies spend millions of dollars to train their geoscientists this way in hopes of more successful oil and gas exploration. Carbonates, constructional or reefs in particular, provide a significant amount of the world's oil and gas reserves. So, one of the most frequented spots companies send their employees to learn about them in their proper setting is the Turks and Caicos platform in the British West Indes. On this platform almost all of the carbonate depositional environments are present and accessible for study. These include oolitic shoals, patch and barrier reefs, protected lagoons, carbonate beach sands and tidal flats. The history of the platform and the Bahamas in general began in the Triassic when the Atlantic Ocean rifting commenced. Some of the rotated normal fault blocks were spots where reefs nucleated, and their growth has continued to the present day. Recently in the Pleistocene, sea level was about 25 feet higher than it is presently. The reefs, beaches and ridges that formed then are the islands of the Turks and Caicos themselves today as they are exposed above sea level. The implications are that the platform has been the locality of uninterupted carbonate deposition and reefal growth without any signs of interference from a global Flood. This is evident in several places throughout the platform. First consider the ability to interpret the past based on present observations. When one snorkels from the fringe reef north of Providencialis towards the island they encounter a subtidal section where low energy waves create a cross-bedded pattern in the sand of the sea floor. In this area sand dollars are abundant and water depth is about 10-15 feet. 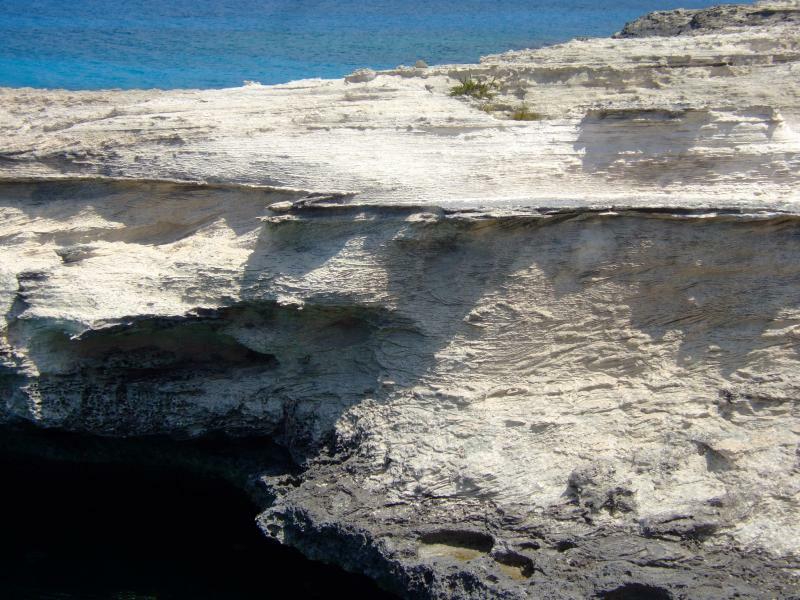 On the west side of the island of West Caicos a fossil barrier reef is evident along the coastline. 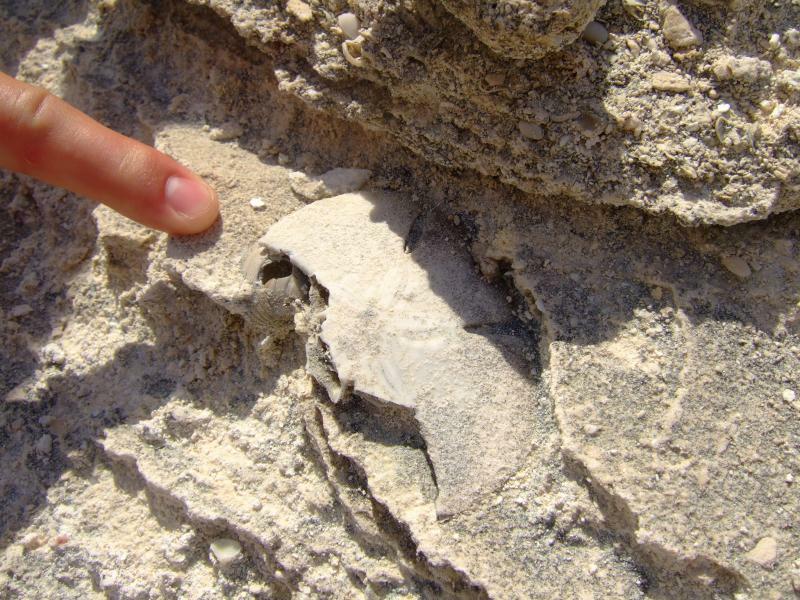 Just behind that fossil reef, cross-bedded sand is encountered and fossilized sand dollars are abundant (see photos below). This is just one proof that past environments are very similar to modern ones. Certainly a catastrophic worldwide Flood could not have deposited and buried organisms in the same tranquil environments we see them today. Next consider the primary food of the locals of the islands, the conch. If you traverse the three-foot deep water off the north coast of Ambergris Cay on the southeast part of the platform you will find numerous conchs grazing along the pure oolitic carbonate sands. The oolites themselves are a testament to their position on the platform. They are formed in high energy environments often related to the sometimes strong tradewinds hitting the platform from the east. 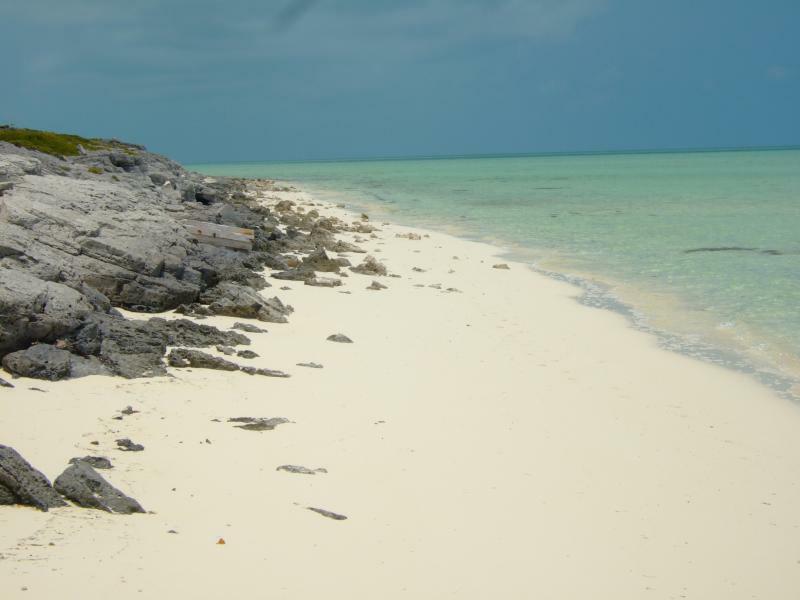 If you go onshore Ambergris Cay you will find that the island itself is made up of cemented oolitic sands testifying to a similar environment in the past. 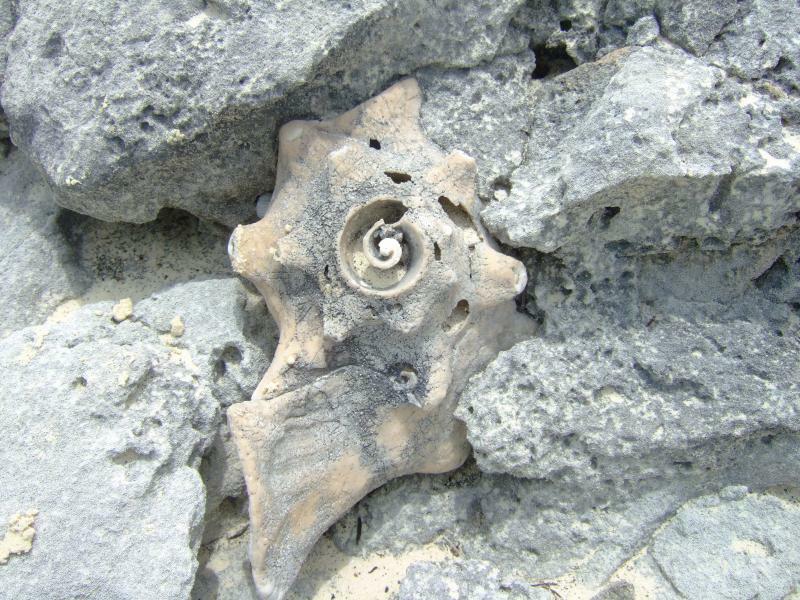 Not only that, but as you might expect, numerous fossilized conchs can be found (see pictures below). Next there is the issue of unconformities. 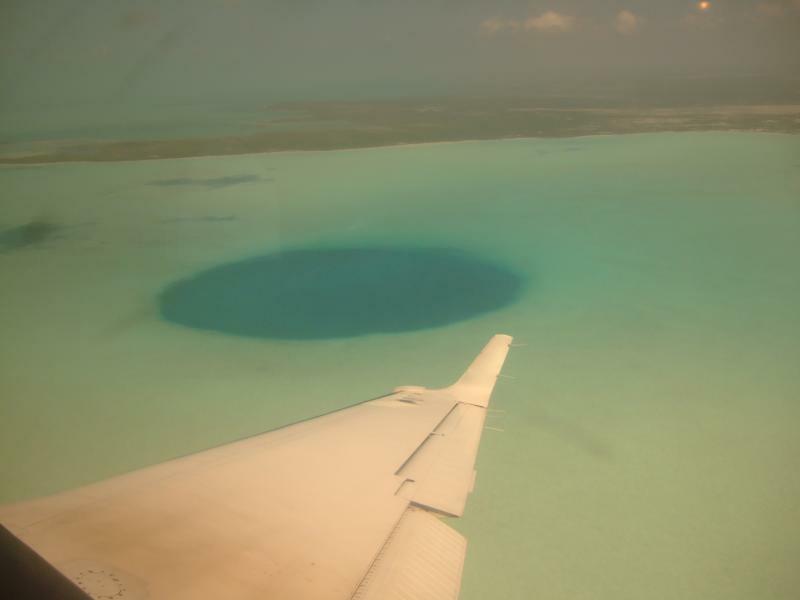 There are sinkholes on the island of West Caicos. 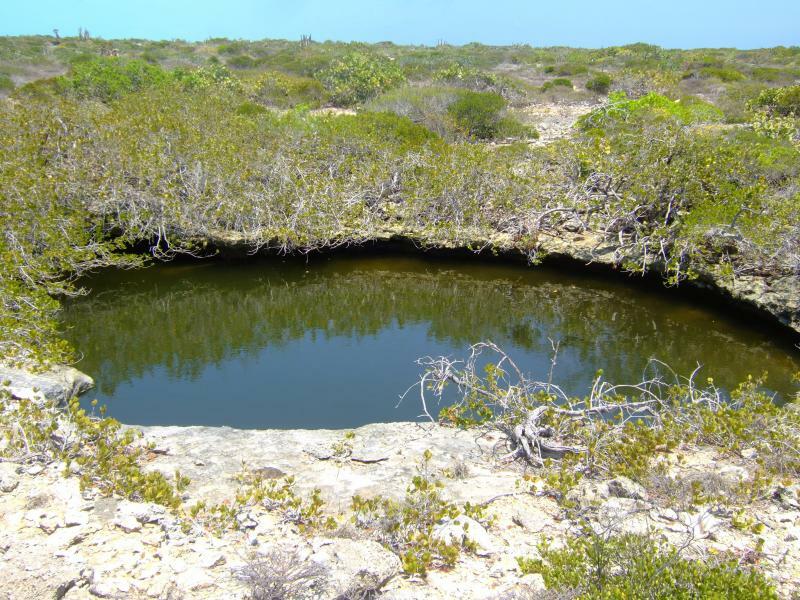 Sinkholes form when fresh water dissolves limestone and the rock above collapses. It is not hard to explain these, but there are also massive sinkholes on the platform interior as well. These are covered by sea water presently. The implications are that sea level was lower in the recent past. Low enough for fresh water to invade and leach the limestone before sea levels rose to present levels. Most likely this was during the recent ice age about 10,000 years ago. Even if we ignore the ages, we cannot deny that sea level was lower and remained low long enough to create the sinkhole then rise again to its present level. This does not fit within the model of a catastrophic Flood where waters flood the earth then abate to present levels. Note the sinkholes below. To summarize briefly, the modern Turks and Caicos platform is very well understood. Geologists understand the reasons why fringing reefs and patch reefs are where they are. They understand why oolitic sands form where they do. Also, the faunal communities are very delicate and specific to their preferred wind and wave conditions. Any disruption to this condition is fatal. There are reefs on the northwest corner of West Caicos Island that are dying as the carbonate sand beaches are prograding over them. They cannot survive if their suroundings are disturbed even in the slightest. It is this knowledge that gives the geologist the ability to explore the rock record with a greater degree of confidence. The rock record is full of these carbonate platforms and their associated depositional environments. But can we really use our knowledge of the modern to interpret the past? Yes, and it is proven here in the Turks and Caicos. The Pleistocene outcrops look identical to the modern envornments right down to being able to predict the sediment patterns and the faunal communities. This knowledge has also helped industry geoscientists successfully predict oil and gas reserves in even more ancient, but still similar, carbonate platforms. It should be apparent that a worldwide Flood that is supposedly responsible for much of the rock record and most of the fossil record could NOT have created an entire platform identical to the one we see today preserving every minute detail, much less many others like it around the world throughout the rock record.